Teddington Action Group has questioned the necessity of low-flying aircraft from Heathrow and state that they are flying lower compared to other airports causing more noise, more suffering and more CO2 emissions than at almost any other airport in the World. Subsequently, it asks the question what impact this is having to those on the ground who are experiencing this increase in noise and its effects on health. In a paper (full extract below) to all mayoral candidates as well as the Department for Transport, and the Environment Select Committee, TAG have analysed using tools used by Heathrow airport and NATS, which are recognised by the aviation industry to demonstrate how much lower and consequently noisier flights are in and out of Heathrow. The paper asks that the Heathrow Noise Regulations issued in 2010 be tightened so as to require planes to climb from Heathrow at a rate of up to three times that which exists at present. This will bring Heathrow into line with other major international airports. 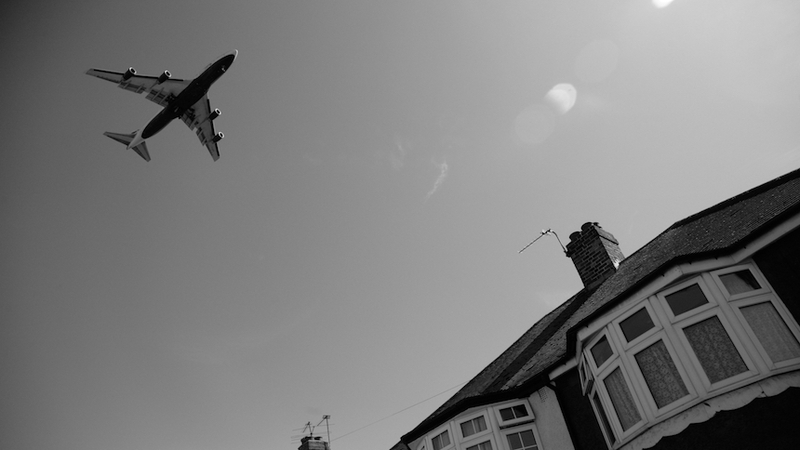 Are Low Flying Planes at Heathrow Causing Us Harm? There are required minimum rates of take-off at Heathrow set out in the Heathrow Airport London (Noise Abatement Requirements) Notice 2010. The requirements are that planes climb to 1,000 feet by 6.5 kilometres from the point at which they start their take off run or “start of roll”. Once they reach 6.5 kilometres from start of roll, aeroplanes are required to climb at a rate of not less than 4% or 1 in 25. The trouble is that these rates of climb are so low and out of date that even a World War II Lancaster Bomber fully loaded could make that. We in the Teddington Action Group have taken details from both WebTrak and Flight Aware.3 WebTrak is preferred by Heathrow and following an audit from NLR Netherland Aerospace Centre is stated to be 99% accurate. However, WebTrak is not available at all airports. We have therefore used both sources. There are cost balances. The take-off time for a short haul flight to northern Europe is a relatively larger proportion of the total flight time compared to that of a long haul flight. It therefore makes commercial sense to take off quickly, save fuel and pay the extra servicing costs. For long haul, the take-off time represents a smaller proportion of total flight time. It therefore is more commercially economic to take off slowly, burn more fuel, pump more CO2 into the air and pay extra fuel charges while saving on the servicing costs of a shallow take-off. Prior to May 2014, flights of heavier aircraft were much higher. We have recorded, again through Web Trak, some flights prior to the 31st May 2014 with an A380 to Dubai at 3,100’ at Swan Island, Twickenham (12 kilomteres from start of roll). A Boeing 747 to Kuala Lumpur was at 4,300’ at Swan Island and an A330 to Cairo was at 4,500’ at Swan Island. Heathrow conducted its own investigation by a company called PA Knowledge, which concluded that heights of planes on departure had reduced and showed one plane flying recently as low as 1,423’ by Swan Island. 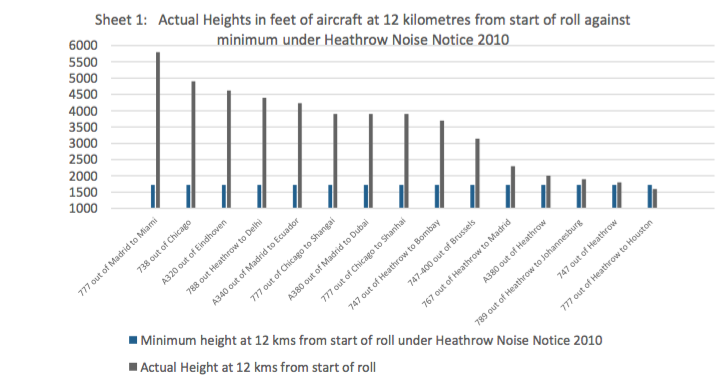 8.6% is the initial effective rate of climb required by the Heathrow Airport London (Noise Abatement Requirements) Notice 2010 in order to get to 1,000’ by 6.5 kilometres from start of roll. Taking this rate and the subsequent rate of 4% gives a net climb by 12 kilometres from start of roll of 5.8%. This rate of climb gets a plane to 1,720’ by 12 kilometres from start of roll, which is Swan Island / Teddington / Twickenham / Hampton area to the east and Windsor Castle, Englefield Green and Egham areas to the west. At this height planes are causing a huge amount of noise – enough to cause very serious annoyance. 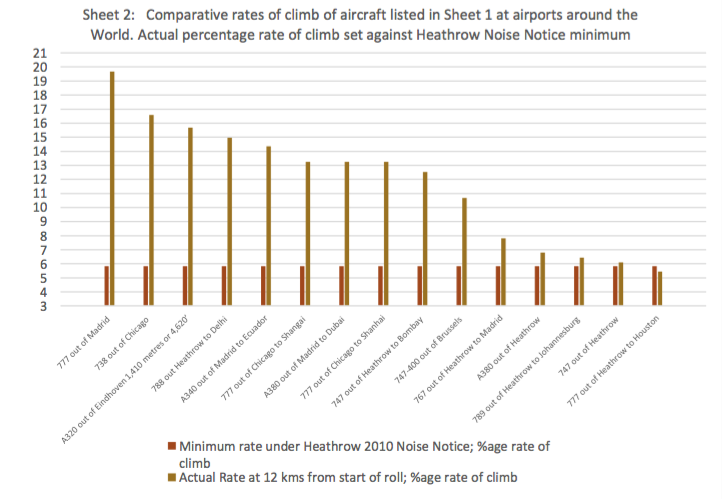 Sheet 2 below shows the planes in Sheet 1 by rates of climb. The steepest aircraft climb recorded was out of Madrid with a 777 to Miami which climbed to 5,800’ by 12 kilometres making a rate of climb of just under 20%. One of the few high climbing planes out of Heathrow was a 788 to Delhi that recorded a rate of 15%. By contrast an A380 managed a rate of 6.8%, a 747 one of 6.1% and a 777 one of 5.7%, the last not even making the required minimum, although it was the same type of plane that made the maximum rate of climb out of Madrid. Research and modelling have been carried out to show that noise diminishes with distance and therefore height. It may seem logical that the farther away something emitting noise is, the less sound is suffered by the recipient. The same applies to height: the higher a plane, the lower the noise impact on the ground. Obviously the plane itself will not be making less noise but more of the plane’s noise will be absorbed into the airspace between it and the ground. In other words, the steeper the climb, the less disturbance for people under Heathrow take-off paths. This conclusion is confirmed by NATS who have carried out a noise modelling exercise to show the noise on the ground emitted by various types and sizes of planes. 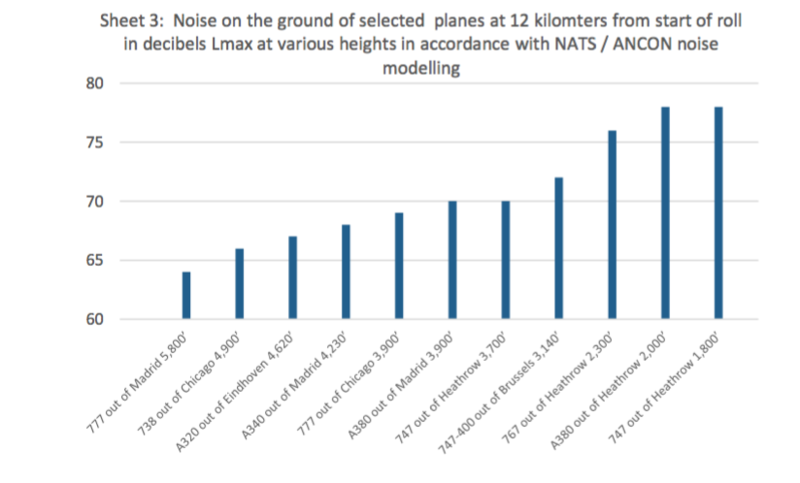 Sheet 3 shows the noise emitted by the planes at various heights in accordance with the ANCON / NATS Noise modelling. The noisiest plane is the lowest flying and set at 78 decibels, which is the typical 747 / A380 reading at the NPL Noise Monitor. The noise is taken for all planes to be the amount emitted from a 747. 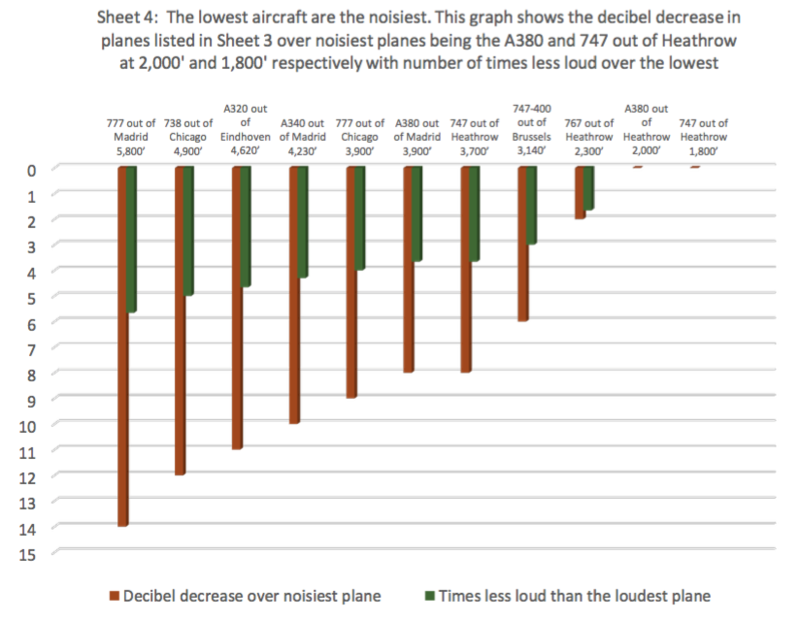 Sheet 4 shows the decrease in decibels and loudness with the different plane heights compared with the two lowest planes departing out of Heathrow. It can be seen that by 12 kilometres from start of roll, a plane departing out of Heathrow and getting to a height of 4,000’ will make 10 decibels less noise at ground level than one getting to a height of 2,000’. The logarithmic nature of decibels means that a difference of 3 decibels equates to a doubling of noise. Two identical planes emitting 76 decibels between them will each be emitting 73 decibels. 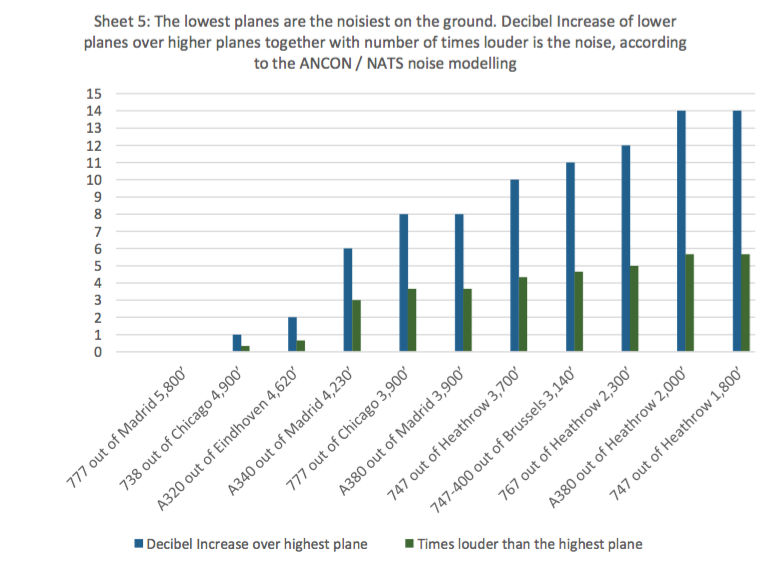 We can see from the Sheet 4 graph that the A340 out of Madrid is four and a half times less loud than the lowest planes leaving Heathrow – and there is no need for the Heathrow planes to be that low. There are also noise savings all the way along the flight path prior to the 12 kms point if planes are climbing more steeply. Sheet 5 shows the difference the other way round using the Madrid 777 as the baseline. So using the ANCON / NATS model the 747 travelling out of Heathrow at 1,800’ was five and a half time louder than the 777 leaving Madrid. All the planes leaving Heathrow, apart possibly from one discussed below, can climb at a rate far in excess of the minimum required, which is out of date and simply being abused by the operators to increase profits at the expense of noise nuisance. People on the ground are being used as sacrificial lambs to pander to the airline industry’s desire to save on servicing costs. The health consequences of excessive noise have been well documented. Lack of sleep causes extensive harm and there are substantial learning deficiencies in children who have been exposed to excessive noise. Even the Airports Commission published evidence of this albeit after it had issued its Interim Report and only one month before its Final Report.9 The health costs from aircraft noise across the UK have been conservatively estimated to be in the region of £540 million each year and at least one million people’s health in the UK could be affected by aircraft noise10. It is clear that Heathrow have not even scratched the surface on compensation to be paid to people suffering the consequences of Heathrow’s operations. The whole budgeting of the operation of the airport and proposals for expansion are based upon people just “putting up and shutting up”. Properties up to 30 miles away may need to be insulated because of the operations of Heathrow. The likely cost is £2 billion after the proposed expansion rather than the £700 million proposed by Heathrow11. Unless this is done, planes will not revert to a proper rate of climb. Both the CAA and Heathrow have repeatedly said that they have no control over airlines on how they operate departure climb rates over the Noise Notice minimum (extraordinary as that may seem, if it is indeed true). Heathrow do not appear to oppose the principle of raising the minimum rate of climb saying of it “I think we’re all agreed [it] could be a positive step”. From Sheet 2, it can be seen that all the large planes can manage, and do regularly manage, the suggested increased take off rate apart possibly from one, so there is nothing in this that cannot be done, with the one exception dealt with below. It is being regularly done at other international airports. Heathrow subjects more people to more noise than any other airport in the World. There is no reason why it should not meet proper standards of environmental cleanliness. The benefits of proper conduct to surrounding communities are enormous. It is not as if we are asking for anything new. All this was being done prior to June 2014. It would stop the cost cutting abuse of the current system. Not only is the current system of low flying wreaking havoc amongst the communities on the ground, it is damaging to the climate by producing more CO2 than is necessary12 as well as impeding the diminution of climate change in accordance with our protocol obligations13. It is also contrary to the Government’s current stated policy of limiting and where possible reducing the number of people significantly affected by aircraft noise as is evidenced by the rise in complaints set out in the first paragraph above. Why does this Government deliberately allow planes to fly low, harm its population, damage the development of its children and needlessly pump extra CO2 into the atmosphere? Does it not take its obligations to reduce the harmful effects of excessive noise and its responsibilities for the reduction of climate change seriously? Does the evidence show that all planes can make the proposed rates of climb? Yes, it does from the above apart possibly from one plane. That one plane is the Airbus A380. It is our view that the A380 has been erroneously granted a noise Quota Count of 2 on departure and 0.5 on arrival15. That is half that of the older 747s and is supposed to indicate that at 2 versus 4, the A380 is half as loud as the 747. Experience and measurements have shown that it is anything but. It is a monstrously noisy plane that travels at low altitude on departure. How or why the A380 got past the authorities and got a noise quota count of 2 must remain conjecture at this stage – maybe misconduct is involved somewhere. One thing is for certain. It should never have been given a Noise Quota Count of 2 on departure and 0.5 on arrival. It is a noisy beast and should not enjoy the privileges associated with a Noise Quota Count of 2 on departure that allows it to fly at night out of Heathrow. The aircraft in its current form should be strictly limited in its operations at Heathrow, with no flying between 8pm and 8am. 9 Queen Mary University – Aircraft noise effects on health Dr. Charlotte Clark. See also James Lees of the Airport Environment Federation in the Huffington Post and The Lancet to name but a few. Depending on the destinations, lost items will go through settlement procedures according to the respective conventions ratified by the two cities that the passenger is flying between. Do your calculations take into account the point at which aircraft are starting their climb i.e. airport heights above sea level? Madrid 610m, Santiago 474m, Chicago 204m, Heathrow 25m. Hi Peter, We believe that they do but further enquiries of Web Trak would be required. Flight Aware would take account of the starting point since their calculations are rate of climb rather than the starting altitude. The figures have been put to Heathrow some months back and they have not contradicted them. This is very interesting and informative but one thing I haven’t understood is why airlines would choose to vary their rate of climb at different airports. Do other airports dictate the rate of climb, unlike Heathrow? I was think thinking that too. Do they have different rules at different airports, maybe? Again great work tag!!!! Thanks.